We have decided to provide regular updates because the Controller role is one of the more important roles that we carry out. It is also one of the less well known. The Controller and Auditor-General is often referred to as a “watchdog” on Government spending. An important part of the watchdog aspect is the Controller role. In the Controller role, we provide assurance to Parliament and New Zealanders that the Government has spent public money in line with Parliament’s authority. The Controller and Auditor-General carries out his Controller role throughout the year, and reports more fully to Parliament during December after the end of the financial year to 30 June. There is more background information at the end of this update. We have decided to increase the frequency of reporting on the Controller function. This update covers the first six months of the 2018/19 financial year. We have a strong interest in New Zealanders’ trust and confidence in the public sector. A key element in that is our role in helping to ensure that all government expenditure is properly authorised and within the law. What have we found so far in 2018/19? Most government spending for the first six months of 2018/19 has been properly authorised and is within the law. However, we have confirmed two instances that were not properly authorised. We have reviewed the amounts of public spending for July to December 2018. Because the spending signalled in the Budget is not passed into legislation until late August each year, the Government needs temporary authority to spend public money from 1 July until the legislation, the Appropriation (Estimates) Act, is passed. That temporary authority is provided by the Imprest Supply (First for 2018/19) Act 2018, which is passed in June. When the Budget becomes law (that is, through the passing of the Appropriation (Estimates) Act), the first Imprest Supply Act expires. Parliament then passes a second annual Imprest Supply Act. The Imprest Supply (Second for 2018/19) Act provides limited, additional authority for expenditure that was not envisaged when the Budget was put together earlier in the year. Authority under the second Imprest Supply Act is exercised in much the same way as the first Act, and it remains in force until the end of the current financial year. We have examined the amount of Government expenses, capital expenditure, and capital injections made under both Imprest Supply Acts and have concluded that spending was within the overall limits set by those Acts. We have confirmed two instances in which departments have spent public money outside the authority provided by Parliament. The Ministry of Social Development (MSD) has applied money to situations not covered by the law. The Government had legislated for the Winter Energy Payment to be paid from Vote Social Development to eligible persons over the winter period. The first such period was 1 July 2018 to 29 September 2018.
individuals who were absent from New Zealand for more than four weeks at a time. This means that some of the winter energy payments were unlawful because they were made outside MSD’s legal mandate (under the Social Security Act 1964) and they were also made without Parliament’s authority to spend (under the Public Finance Act 1989). It was therefore unappropriated expenditure. We have instructed MSD that it must not make payments to people in those ineligible circumstances when the winter energy payments resume on 1 May 2019 unless Parliament passes legislation in the meantime to allow those payments. MSD acknowledges its error and has taken action to rectify matters through an amendment to the Act to allow such payments to be lawfully paid. In the meantime, our auditors are working with MSD to confirm the total amount of unappropriated expenditure. The Ministry of Business, Innovation and Employment (MBIE) requested spending authority from Ministers in August 2018 under the Imprest Supply Act arrangements.1 The request was to create a new appropriation category and increase the amount of departmental expenditure to administer the Provincial Growth Fund, under Vote Business, Science and Innovation. MBIE obtained agreement in August for the increased spending, and it incurred expenses accordingly. However, an error in the paperwork for the approval meant that authority to spend could not be granted until the paperwork was corrected. The correction was made, and the creation of a new appropriation category approved, in October 2018. By that time, some money had already been spent on the basis of the August approval but before the proper authority was in place in October. Our auditors are working with MBIE to confirm the amount of expenditure incurred prior to the corrected paperwork and the proper authority being in place. In New Zealand, the Government needs Parliament’s approval to spend public money. Parliament authorises the Government’s spending plans through the annual Budget and the resulting legislation (Appropriation and Imprest Supply Acts). The role of the Controller involves testing government departments’ financial systems and reports. Basically, we are checking whether government departments have spent public money in keeping with the authority set out in those appropriations. Spending outside the appropriation is called “unappropriated expenditure”. If we suspect that some spending might not have been within an appropriation, our team carrying out the Controller work investigates. If any unappropriated expenditure is confirmed, the Auditor-General advises the Government on what action is needed and ensures that Parliament is told about it. 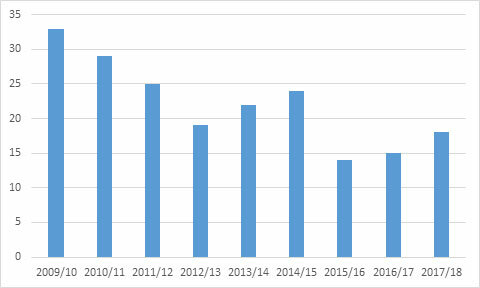 In the last decade, the overall trend has been a reduction in the incidence of unappropriated expenditure, as shown below. All unappropriated expenditure must be reported publicly and to Parliament.3 Part of the Controller’s role is to check the completeness and accuracy of the statements about unappropriated expenditure that are reported to the public and to Parliament. Every year, the Government reports on unappropriated expenditure within the Financial Statements of the Government of New Zealand (the Government’s financial statements). On 9 October 2018, the Treasury published the Government’s financial statements for 2017/18. The financial statements include a Statement of Unappropriated Expenditure on pages 131 to 137; they reveal 18 instances of unappropriated expenditure in the year ended 30 June 2018, amounting to $119 million. In December of every year, the Auditor-General tables in Parliament a report on our audits of public organisations that are part of central government. In our report for 2017/18, we provided an explanation and observations about the extent of public money spent without appropriation during 2017/18, why that happened, and how that compares with previous years. The report is available on our website. 1: Although Parliament authorises expenditure through passing Imprest Supply Acts, current rules require that the specific nature and amount of spending under those Acts, and the appropriation to which it relates, must also be authorised in advance by Cabinet (or by delegation to joint Ministers). 2: We explain more about the public finance system, appropriations, and the Controller and Auditor-General’s work in our reports each year on the audits of central government (see, for example, oag.govt.nz/2018/central-government/part3.htm). 3: It is reported in the annual reports of government departments responsible for administering the appropriations and in the Government’s financial statements. The statements are audited by the Controller and Auditor-General.